Made right here in Australia in their their Canberra-based workshop, Byrne Woodware baby mobiles are perfect to bring a bit the warmth of timber into contemporary nurseries. There are several gorgeous mobile designs, so choosing a favourite is difficult, but I’m staying true blue and announcing my top pick as the Wooden Australian Animal Mobile. 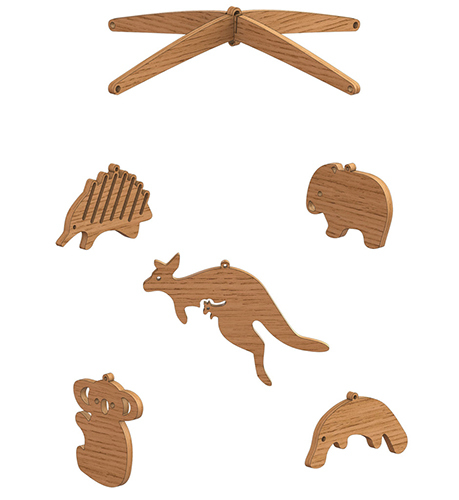 Byrne Woodware’s Wooden Australian Animal Mobile includes all of our favourite iconic Aussie animals – starring a kangaroo (with sneaky joey on board), platypus, echidna, wombat and the ever popular koala. Each animal piece is cut from Tasmanian oak or Sapelle hardwood veneer before being sanded, oiled and slipped into a flat pack for easy assembly and shipping, enabling you to post Aussie animals all over the world! The Wooden Australian Animal Mobile is priced $48 and available directly from Byrne Woodware. 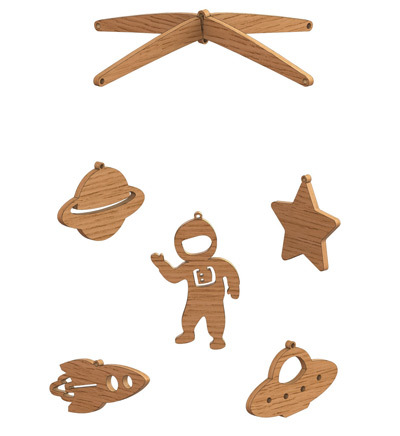 Check their site for other designs, including this delightful space astronaut mobile.